Have you ever let a room on the popular accommodation site Airbnb? Ever shared a ride with pseudo taxi service Uber? If you participate in what’s now called the “sharing economy”, you may have some tax to pay. The Australian Tax Office (ATO) says the sharing economy is a new way of “connecting buyers (‘users’) with sellers (‘providers’) for economic activity”. That definition includes a host of new services like Airbnb, Uber, AirTasker and MenuLog. For the last few months the Tax Office has been fighting with Uber to introduce goods and services tax (GST) on its share-drivers (that is, everyday people who decide to become casual Uber employees). Are you part of the sharing economy? The Tax Office maintains that Uber drivers are viewed as being independent contractors, so they’re required to register for GST like normal taxi drivers – no matter what their yearly earnings are. use a car to transport members of the public for a fare (Uber). Providing a sharing economy service for money most likely means you’re earning assessable income. And that’s what the Tax Office wants to tax – even if you’re not “carrying on a business” in doing so. These records will help you to include these amounts in a tax return, and pay any tax owing from your activities on time. If you provide sharing economy services (like those listed above) and you earn money from those services, you’re carrying on an enterprise even if you’re not registered as a business. So, if your annual turnover from that enterprise activity exceeds $75,000 you’ll need to register for GST. That’s not counting Uber drivers — if you provide “taxi travel” you need to be registered regardless of your turnover. lodge an activity statement and remit any net GST from your activities. 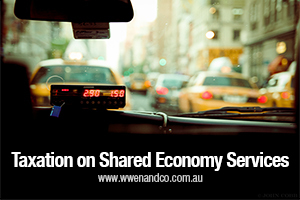 For advice about your tax obligations in the sharing economy, please contact the chartered accountants at our Epping Office of W Wen and Co.